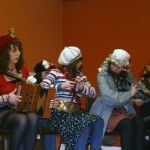 Large crowds are expected to converge on the East Galway village of New Inn on Saturday night 23rd January for the eagerly awaited re-scheduled annual Mummers’ Festival which takes place in the local Leisure Centre. The postponement of the festival due to the bad weather forced the organising committee to condense the event into one night. This means that both the Senior and Junior competitions will bestaged on Saturday night. This will result in an enlarged programme which will begin at 7 pm and go on until late. This major festival attracts patrons from all over the country and as it is staged for the 32nd year in New Inn it continues to grow in popularity. Patrons visiting the village can expect a feast of traditional music, song,dance and storytelling, with top class entertainers participating with the various groups. 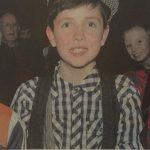 It is expected that up to seven shows will be staged on Saturday night, including groups from Lackagh, Rahan, Rohenagh and a local New Inn group. The emphasis is very much on participation at the Mummers’ Festival, but there is also a competitive element which adds to the excitement for both participants and patrons. Every group likes to win at this event, and in addition to the prizes for the winning groups, there is recognition for exceptional individual performances. Awards for Best Musician, Dancer, Flute Player, Singer,Storyteller, as well as The Most Outstanding Entertainer will be presented at the festival. The New Inn Mummers’ Festival is now firmly established as a significant traditional event in the entertainment calendar, and has grown and developed over the past three decades. This weekend groups from Co. Galway and from outside the country will provide a feast of entertainment to the appreciative patrons who have loyally supported the festival over the years and for whom a visit to New Inn is very much looked forward to. Festival Secretary Michael Finnerty confirmed earlier this week that everything is now in place for Festival 2010. The groups are all confirmed, and rumours of new talent emerging are adding to the anticipation. 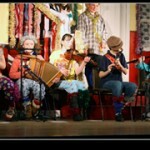 If you are a lover of traditional music, song,dance and storytelling the venue to be at is New Inn on Saturday night. Every festival in New In produces star performers and over the years many of those first spotted at the Mummers’ event went on to national and international stardom.